the giant cells areswollen and more rounded (owing to their giving ofi a larger num-ber of processes), than in such animals as the Sheep and the Pig.In the latter these cells are more simply pyramidal, and have asmaller number of inter-connecting processes. Such cells are,moreover, scattered over a wide area. But in the Cat and otl^erCarnivora, the area in which the * giant cells are found is veryrestricted—much more so than in Man and the Quadrumana,. Again, according to Bevan Lewis, a peculiar kind of globose *cell with few connecting processes, is to be found amidst the otherelements in the second and third layers of the Pig and Sheep, andalso in Apes—though such elements have been met with in Manonly in the brains of Idiots or Imbeciles. 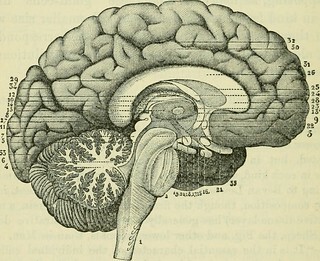 452 THE INTERNAL STRUCTURE 4.—The Principal Commissures of the Brain. The connecting or, as Meynert terms them, the associa-tion system of fibres of the Brain belong to three principalcategories, each of which will be now briefly described.